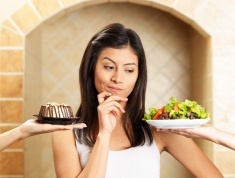 I get this question often…what kind of food should I be avoiding? There are so many different fad diets out there telling you to eat this and don’t eat that. Even in the popular news media, you’ll hear to eat a certain food one day and then very soon after you’ll hear not to eat that same food because it’s unhealthy. Let’s see, as far as diets go, there’s low carb, high carb, low fat, high fat, high protein…the list goes on. It’s really hard to keep up! When it comes to carbs, fats, and proteins – you shouldn’t be avoiding ANY one of these. Each one has a very important role in regulating your metabolism. You NEED each of them in a quantity that’s appropriate for your body. That quantity is generally associated with your height, weight, and physical activity level. There are lots of apps you can use to help you determine your individual needs. Personally, I really like the Lose It app and it’s what I recommend to my clients. So if carbs, fats, and proteins aren’t the enemy, then what is? You should be avoiding a very specific types of each of these macro-nutrients. Let’s break it down by each one. Carbs – substantially limit your intake of added sugar and processed white flour products. Make sure you’re reading your nutrition labels. Added sugar is usually listed in grams, which makes it difficult to determine how much you’re actually eating because we tend to measure sugar in teaspoons. Easy fix: 4 grams of sugar is approximate 1 teaspoon. I would recommend consuming as little added sugar as possible. Your body does need sugar; however, it doesn’t need ANY added sugar. Your body creates all the sugar it requires by breaking down the carbohydrates that you eat. Fats – substantially limit your intake of saturated and trans fats, while avoiding Fat Free products! Saturated fats are easy to recognize as being solid at room temperature; think butter, which is 100% saturated fat. Research studies show that consuming a large amount of saturated fats greatly increases your likelihood of heart disease. And, they’ve also been shown to contribute to obesity. Instead opt for your natural mono & poly unsaturated fats, which can be found primarily in nuts, seeds, avocados, and fish. Trans fats are created through a process called hydrogenation. The purpose of this process is to make unsaturated fats act like saturated fats (or to make them solid at room temperature); think margarine. These artificially created fats have been found to profoundly increase your risk of heart disease, obesity, and many other health issues. Luckily, they’ve been removed from many products, but you still need to watch out for them on most of your processed food labels – like prepackaged snack foods. Avoid processed foods that are marketed as fat free or low fat. This is a marketing ploy to get you to purchase the product. Fat has gotten a bad rap, mostly due to the major health risks associated with consuming saturated and trans fats. Unfortunately, when companies remove the fat from a product, it no longer tastes very good. So, what do they do to improve the taste? They ADD more sugar (read above about sugar)! Proteins – substantially limit your intake of red and processed meats while also avoiding protein supplements. Red meats are composed of a large amount of saturated fat (read above about saturated fat). There’s a large amount of sodium and other preservatives added to processed meats (think lunch meat or cured meats) in order to keep them fresh for a long period of time. And, also to improve their taste. A high sodium intake is linked to heart disease, high blood pressure, and contributes to obesity. Those other added preservatives, like nitrites, have been proven to have a carcinogenic affect when cooked at high temperatures. The average person requires .8 grams of protein per kg of body weight (that’s kg, not pound of body weight!). If you log your daily food intake, you’ll probably notice that you already get WAY MORE than this in your diet. So, why is there a market for protein supplements? First, anyone who is trying to build muscle through weightlifting does require a little bit more protein than the average person – think 1.2 grams per kg of body weight. However, you’ll notice if you logged your food intake that you’re still probably already getting more than enough. Also, the meat and dairy industries (our main protein sources) are very connected at the political level. Bottom line on protein supplements – you’re already consuming more than enough protein and your body is actually able to convert and utilize the protein from actual food much more effectively than from any concentrated supplement. Protein intake when trying to gain muscle has much more to do with proper timing than any supplement. 1. Limit your intake of processed foods and focus on eating foods as close to their natural state as possible. 2. Don’t consume too much of any one of the macro-nutrients. Focus on eating a varied diet that includes the right amount of healthy carbs, fats, and proteins for your individual needs.